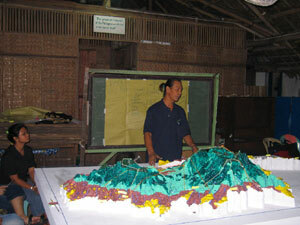 1:20,000 scale model of the Northern Negros Natural Park (NNNP) (July 2007), Negros Occidental, Philippines. The NNNP was proclaimed a Natural Park on August 15, 2005 under the initial component of the National Integrated Protected Areas System. The 3D model (804 km2) was built in the framework of the Northern Negros Natural Park Conservation Project during a week-long workshop held at the Negros Forests and Ecological Foundation’s (NFEFI) enclosure by the Capitol Lagoon in Bacolod City. It covers the Municipalities of San Carlos City, Calatrava, Toboso, Sagay City, Cadiz City, Victorias City, EB Magalona, Silay City, Talisay City, Murcia, DS Benedicto. Data depicted on the model reflect the cognitive maps of local governments, municipal agricultural officers, village chiefs, national and provincial government agencies, municipal planning and development officers. The Natural Park harbors the largest forested area on Negros Island and is home to many rare, endemic and endangered species. The participatory mapping exercise involved members of local communities, NGOs and LGUs and had also a training component aiming at building capacity in participatory NRM planning. 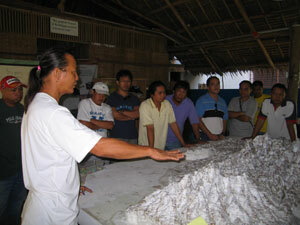 The resulting 3-D model and derived maps have been used for natural resource planning and management. The area represent the major watershed of Bacolod and serves as many as ten municipalities and cities in terms of water. 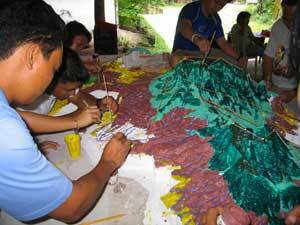 The model has been produced by local stakeholders in the framework of the Northern Negros Natural Park Conservation Project run by the Foundation for the Philippine Environment (FPE).